Want to kick back and listen to me muddle and fuddle up another classic tale? Good. Because I have another Spinning In Cowgirl Boots for ya. 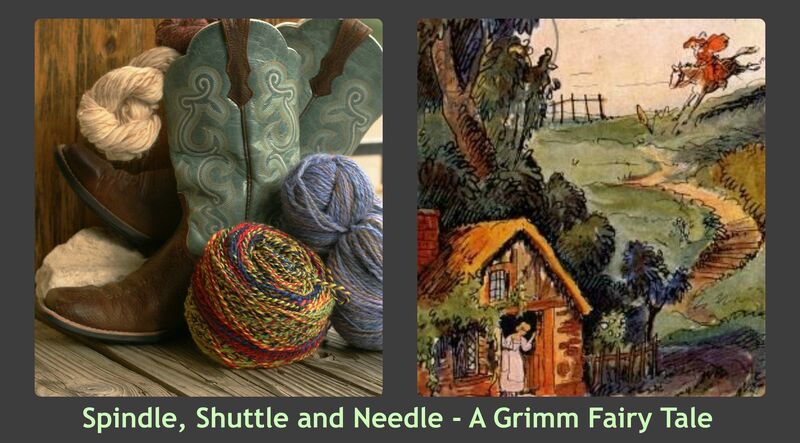 Today I’m re-telling, in my own special ramble-y way, Shuttle, Spindle, and Needle. Its tale number 188 in the Grimm’s Fairly Tale list and you can find a real copy to download and read courtesy of the University of Pittsburgh. Or you can just listen to me! In this tale we have a little girl who is sad and lonely.This of course means that she is also beautiful and modest and possessing of every virtue. I’ve noticed that in the fairy tales all sad and lonely little girls are perfect. They are never ugly or foul mouthed. They don’t have bad skin or crooked teeth. They never get sick of being sad and lonely and decide to act out, paint their eyes black, get some tattoos, and dye their hair pink to get themselves some attention. Mostly they simply wait around being sad and lonely and perfect and wait for a prince or a king or a fairy godmother to notice how perfect they are. Its a strategy that always works out for them. I’m spinning 100% merino in colorway Sunset from Fibers For Ewe, which is sadly out of business I think. I’m spinning it over the fold, or semi-woolen. It seems to draft a little easier that way. If you like this sort of thing I have more Spinning I Cowgirl Boots! You can find them all here. 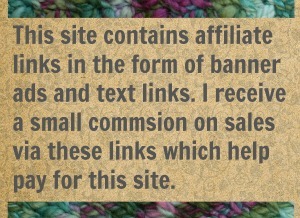 8 Comments on "Spinning in Cowgirl Boots – Spindle, Shuttle, and Needle"
Ok. Just as soon as you have finished everything in the world that you want to knit, you’ll take up spinning. 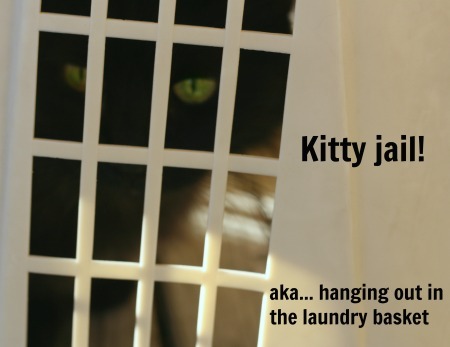 I’ll back with you for your first spinning lesson in…. 435 years. If I lived near you I’d probably take up spinning now! The whole post, video, story, your hypnotic spinning is just lovely. As I said before you have me intrigued by your spinning but I have too many irons in fire. OK…OK I’ll admit I have been sneeking a peek or two here and there at drop spindle tutorials. Just a peek now nothing serious. One thing though it does look like a ready made kitty toy. Its ok if you cheated on your projects a wee bit with a drop spindle. I’ll never tell! I have heard that lots and lots of spinning classes start you on a drop spindle. I bought one, tried it and now it is a lovely conversation piece. Unlike our lovely hostess, I have Zero patience. I’m not lovely, perfect or even lonely and I’m definitely not in the market for a Prince, handsome or rich. OK. Your magic has worked on me – I have to go spin now. For those of you who do not spin, you are missing something soothing and satisfying. Exactly what she said. Spinning is good for the soul (not just for showing off! ).